We all know how useful duct tape can be – fix a broken pipe, mend a thing or two in space, get rid of warts, etc. 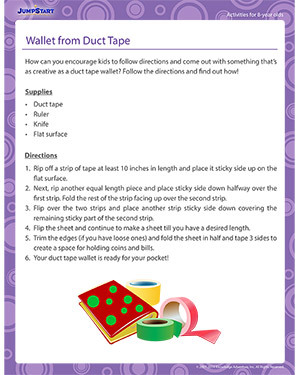 Here’s another innovative way to put duct tape into a cool use – make a duct tape wallet with our easy-to-follow instructions! Download the activity for 8-year olds and have fun making the new space to store bills and coins.